Massachusetts metal garage kits and steel arch buildings custom manufactured and constructed in the The Bay State for small business, commercial and residential use. Our metal garage kits are pre-engineered building systems designed and manufactured for the State of Massachusetts businesses and homeowners. Custom design and price Massachusetts steel arch building garage kits using our metal garage price calculator or our discount quote calculator. We also have clearance sale garage kits we already have in stock thats need to be sold soon. 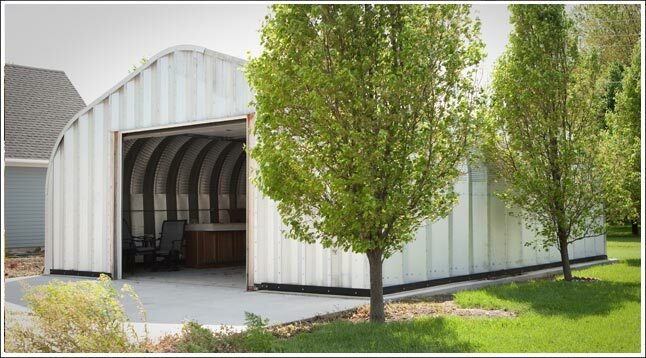 Metal garages are guaranteed for 40 years and manufactured from sturdy 14 to 22 gauge 80,000ksi tensile yield carbon AZ Galvalume® steel coated with aluminum-zinc alloy and silicon. The manufacturing process, is 700% more rust resistant than galvanized steel, gives your building decades of use free from corrosion or need for maintenance. Machine rolled panels have a 7½" deep corrugation throughout each arch for reinforced strength. . All hardware used in the metal building kit is top grade so there are no weak links in the construction of your kit. Custom Massachusetts metal kits are available with 3 standard sizes of insulated or non-insulated walk through doors with custom sizes available upon request. and For large openings used for vehicles and equipment we offer sectional, roll up, or bi-fold electronic overhead doors or manual sliding doors usually used on barns or stables. All doors are made of heavy gauge reinforced steel. Customize your garage kit with your choice of 6 different types of ventilation systems installed right into the roof or wall panels. Skylights made of polycarbonate translucent material with ultra-violet inhibitors are available that conform to the roof's arches and can be placed anywhere on your building. Custom design your garage kit online using our calulator which also gives you the cost of your kit. Place your order with a sales representative and we will send you any documentation you need for permits and inspections such as blueprints, and building specifications. Metal Building Kings® provides turnkey services to help you with land surveys, erecting your building, foundations and more with reputable crews that specialize in metal building construction. We can provide everything you need from planning to construction. You can also access our network of sub-contractors in Massachusetts who are state certified and have solid reputations. The special AkzoNobel Ceram-A-Star® 1050 paint used on your Massachusetts metal garage kit is a silicone-protected polyester coil coating system designed exclusively for Metal Building Kings® steel buildings and comes in several colors that are Energy Star and LEED compliant. Metal Building Kings® distribution locations in Springfield, Boston, Lowell, Worcester, Brockton, Newton, Framingham, and Lawrence, MA coordinate the shipping and delivery from our manufacturing plant of your building's components and instruction manuals to all 6.873 million residents in 14 counties statewide. Choose from 4 different metal garage models with different arched sidewall and roof designs. Metal garage kits and steel buildings are popular in Massachusetts for workshops, warehouses, horse barns, and storage facilities and for both business and home use because they are certified as the best pre-engineered building system to withstand wind storms up to 170 mph winds. Garage kits are easily portable by disassembling the building and reassembling it at a different location. Below are some examples of garage kits, prices and sizes sold in cities and towns throughout Massachusetts. Also learn more how your Massachusetts metal garage is priced out by visiting our pricing page. Every metal building is custom manufactured to Massachusetts's specific codes and certifications. Read here for more on Massachusetts building codes. • The P Model for Massachusetts workshops, residential and small business. Contact Metal Building Kings® for more information on our commercial applications and turnkey services. For homeowners we provide consultation and small scale turnkey solutions to help you get metal garage built right and well planned for your geographic and environmental challenges.